One of the things we miss most here is our favorite pizza. 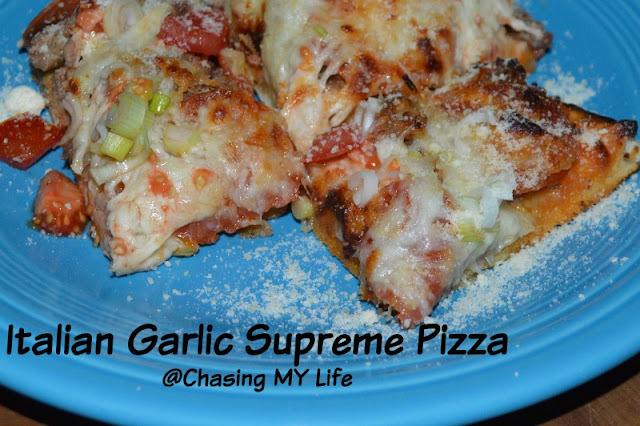 Round table Pizza has an Italian Garlic Supreme that is our ALL time favorite pizza. When I was a kid though my favorite was NUMERO UNO, a southern California local favorite. So I set out to try and recreate both of these and believe I have actually succeeded. 1 cup warm water (110-115 degrees ONLY - If it is to hot, it will kill the yeast! *I am probably the only person in the western hemisphere that does NOT like olive oil. Feel free to substitute it for the avocado oil if you prefer. Add water, sugars and yeast to a bowl and stir well. Let sit 5 minutes until creamy. Add milk, butter, oil, salt and corn meal to yeast mixture and mix with wire-whisk until well blended. Add 2 1/2 cups of flour and mix with paddle for 5 minutes on low. Scrape the sides of the bowl and form dough into a ball. Pour remaining flour (1/2 cup) around the outsides. Use dough hook, and mix for 5 minutes on low. Remove dough from mixer and place in a well greased glass bowl large enough to allow the dough to double in size. On a lightly floured surface, use a rolling pin and roll dough to your desired thickness and shape. If your using a metal pizza pan, or a cookie sheet, lightly grease the surface and sprinkle graciously with corn meal. Place shaped dough on the pizza pan and let rise for 10 minutes. Brush with garlic and oil mixture. Place pizzas in preheated oven and cook for 15 minutes. Reduce temperature to 375 degrees, and cook for 5-10 minutes, or until the pizza looks done. If you're only making one pizza you can freeze the other one for up to 3 months. When you are ready to use it, thaw overnight in the refrigerator or for at least 12 hours. Bring the dough to room temperature about 30 minutes before stretching out the pizza.